No matter how bad the condition of your life and your mind, don’t give up! Regain the territory the devil has stolen from you. If necessary, regain it one inch at a time, always leaning on God’s grace and not on your own ability to get the desired results. Galatians 6:9 teaches us that apostle Paul encourages us to keep on keeping on! Don’t be a quitter! 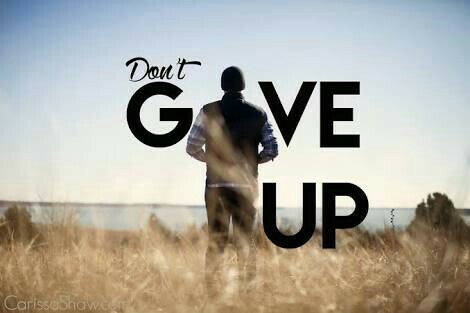 Don’t have the old give up spirit. God is looking for people who will go all the way through with him. Whatever you may be facing or experiencing right now in your life, I am encouraging you to go through it and not give up. It’s very easy to quit, it takes faith to go through. Take a stand and say, I will never give up! God is on my side, He loves me, and He is helping me. You are not alone my brothers and sisters, set your mind that you will never quit until victory is complete and you have taken possession of your rightful inheritance.